The internet has changed so many things in our world. As consumers, snail mail letters were replaced with email. We Skype instead of draining our wallets with long-distance phone calls. And we shop on Amazon instead of fighting for a parking space and dealing with the crowds at the local shopping mall. On the flip side of that, as internet entrepreneurs we use email to market our products and services, Skype to conduct meetings, and can earn a living selling on Amazon.com. And that’s just a small taste of all the disruptions we’ve enjoyed thanks to the internet. One of the biggest disrupted industries, and one of those that provides a great path to a solid making money online venture for an individual entrepreneur, is in book publishing. Specifically, publishing and selling ebooks online. You see, what the big publishing houses do with big offices of editors, writers, administrative staff… and then big printing presses… then distribution centers to get their books out to bookstores around the country… all to hopefully get books in the hands of customers… you can do on the computer you have right now. If that’s not massive disruption, I don’t know what is. With all the red tape, "play to pay" tactics, and the lack of marketing support from the big publishing houses (along with low royalties) many are finding that self-publishing is a much better option (and in most cases a more profitable option!). There are some key differences between this self-publishing (which, by the way, doesn’t have the negative connotations it used to) and traditional publishing process. You won’t be dealing with printed books, for one. That eliminates the expense and hassle of actually creating books, storing them, and delivering them — and that may not even sell. It’s going to be all digital. These are ebooks, which can be read on devices like Amazon’s Kindle, on another tablet or smartphone, or even on a computer. 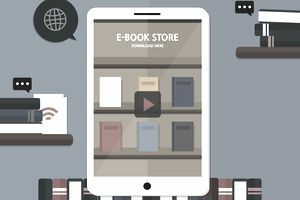 From humble beginnings, ebooks now sell in the millions each year, representing about 20 percent of the publishing market in the United States. Industry watchers say that by 2018, ebook revenues will reach over $8 billion per year. And there is plenty of room for a one-person ebook entrepreneur to get a piece of that market. So let's take a look at how you can make money with ebooks; from the brainstorming, to the writing, and most importantly... the marketing and selling of your ebooks online. Ebooks are, well, books. But in a format where they can be delivered or downloaded online. You can write them yourself, employ writers, use public domain content, and create your ebooks from many sources. And just about any subject can be covered — just as many, if not more, than what a traditional publisher might release because you can tailor your tomes to niche markets. Travel guides, how-to manuals, mystery, romance, science fiction, self-help, technology, religions… just about any subject is fair game as long as there is a market of ready buyers. Also, you won’t have to rely on an editor or publisher telling you whether a book will be published. And you won’t have to rely on a bookstore to put your book on its shelves. You’re in complete control of the entire process. In fact, you’re going to handle everything yourself, including marketing and selling. And that means you get to keep all the profits. They’re nothing to sneeze at. Self-published authors have had big success in recent years. Take Hugh Howey, who sold a series of science fiction books through Amazon’s Kindle Direct Publishing. At one point, he was selling 20,000 — 30,000 copies a month, which generated $150,000 in income monthly. Amanda Hocking, who writes “paranormal romance” and fantasy novels, has sold well more than a million books on Amazon, generating over $2 million in sales. That's proof that you can make money self-publishing on Amazon. Perhaps most famously 50 Shades of Grey author E.L. James’s erotica series started life as a self-published work before being snapped up by a traditional publisher and turned into a movie. Let me show you how to build the same type of business. As an ebook publisher you have a few options available for selling your works. You can set up your own website and sell your ebook directly online. You might make a PDF available to your readers for example. A simple shopping cart or PayPal link and you’re all set. A reader visits your site, they order, and they get a download link and get your book. It’s pretty much all automated, and you simply keep an eye on things to make sure the site is running smoothly. The benefit of this is you control the entire process, get all of the customer information (so you can promote additional products, services, or books), and you can charge higher prices. One of the easiest ways to sell ebooks is to work through a third-party site like Amazon. You may have ordered products, even books, from Amazon in the past. But this is a whole different side to this massive ecommerce site. The big benefit to working through Amazon Kindle Direct Publishing, even though they charge you a commission on your sales, is their reach. Around 89 million Americans are said to be active ebook readers. That’s your potential audience, all those people visiting this site and browsing for a new book. It could be your book they find when doing a search on a related keyword. In fact, 38 percent of daily sales of ebooks on Amazon go to self-published titles. While you may not make as much money as you would selling direct on your own site, you'll have the opportunity to reach an audience who you wouldn't otherwise have access to. The process to selling your ebook on Kindle is straightforward. You sign up, then upload your ebook. They take care of converting it to their proprietary format. Then you’re ready to sell and grow your business through Amazon.com. Which of these options should you go with? I recommend doing both. Put one (or two) of your books on Amazon and think of that as a traffic source... a way for new people to find you; and you get to make profits from the sales of the ebook. Use your Amazon ebooks to drive people back to your website and get them onto your email list. Once you have them on your email list you can follow up with them and sell them additional ebooks from your own site, at a higher price point. Use the best of both worlds! Believe it or not, you might already have most of an ebook written already. If you are already making money with a blog, those blog posts could be turned into an ebook with some editing. Simply collect relevant blog posts into an order that makes sense, make any needed edits so that references that aren’t relevant are taken out, and add an introduction and conclusion, and you’re done. Any blog posts you use should cover the same or related topics and work well together. Of course, that’s only one way to put together the content for your ebook. If you want to publish an original work of fiction or nonfiction — something you write yourself fresh — that is also a good option. The key part, if you’re starting from scratch, is to work steadily towards your goals of finishing that book. Write something every day! Start with an outline and then fill it in. You can also repurpose a book that is in the public domain. This means the copyright has expired and anybody can take the content of those books, and publish them, either updated or reworked in some way or as is. Did you see that book, Pride and Prejudice and Zombies that came out a few years ago? That’s a great example of reworking a public domain book. You can find public domain works, which include classics like Call of the Wild by Jack London and Shakespeare and books on just about every subject you can think of (a quick search yielded dog training guides, a how-to guide for amateur singers, and much more), in places like Project Gutenberg. Another option is you can hire someone else to write your book for you. This is actually a very common practice in the book publishing industry; these writers are referred to as "ghost writers". A final thought to keep in mind is that you don't have to write something like War and Peace. You can writer shorter books for Amazon and sell them a lower price points ranging from $2.99 to $4.99 and people prefer ebooks that are shorter with more focused niche topics. There’s a dirty little secret in the traditional publishing world. Publishers usually don’t actively market or promote the vast majority of the books they release. Only those from established best-selling authors get this attention. But, as an ebook publisher, you’re going to relish having this same control over your marketing and sales strategy. With all the options available, you should have no problem finding a way to get your book title(s) out into the world and grab the attention of potential readers. I recommend a multichannel approach — approach the marketing from several different angles. One definite channel is social media. Leverage your Facebook page, Twitter, LinkedIn contacts, and more to get the word out. When the book is published, post it on Facebook with a link back to your website with more information and a way to order, for example. But it’s not enough to send out one announcement. You have to build buzz around your ebook. Encourage people to tell friends about your ebook and spread the word. Post content related to your book. Create contests. Do giveaways. Get creative with your marketing. You should also promote your book on your blog, get active in forums related to the topic your book is about and tell people about it, and if you have an email list, be sure to promote it there too. You might also offer a free chapter of your ebook. That will get readers hooked so that they want more and will buy the rest of the ebook. The key is to be proactive with your marketing efforts to continually generate buzz and interest for your book. Also, if you're selling your ebooks on Amazon you can do paid ads directly on Amazon to promote your books to a highly targeted audience based on keyword searches and specific products (like related books). Making money from ebooks isn’t automatic. You can’t just put anything in it and hope to profit. It’s not a difficult task, but you should follow some best practices to make sure your ebook draws attention from readers and generates sales. Just because you’re writing a book doesn’t mean you have to stress out. With a plan in place, you can finish your work and put it on sale. You just need to create an outline for the book to follow, set a schedule for when you’re going to write (if it’s original work) or when you’re going to work on it, how you will market the book and when each task needs to be done, and set a goal publication date when it will be offered on sale. It’s a matter of setting aside time each day. You can’t just work on this when you “feel” like it… otherwise, it’ll never get done. You want to write with authority and confidence… and passion. It’s not a good idea to pick a topic just because you think it might be a best-seller. Remember, you can always outsource the writing to an expert as well. Make sure all your text is easy to read and understand. It's better to write in a conversational manner and not in an academic manner. Many experts suggest that you should write at an eight-grade writing level. Double check for grammatical errors, misspellings, etc. Make sure you have a trusted friend or even professional proofreader go over your ebook before publication. There’s nothing worse than releasing a book full of errors — it doesn’t inspire confidence in your readers, can lead to refunds, and bad reviews. Just because you are self-publishing doesn’t mean you want it to like an amateur did it. Hire a graphic designer on a site like Fiverr.com to create a good-looking cover based on your direction and input for not much money. They can also lay out the interior pages too. Just because your book is self-published doesn't mean it has to look and feel that way. So now you understand why selling ebooks can be such a money-maker, it's time to get started. Figure out what type of ebook you want to sell, where you’ll get the content, and then where you’re going to sell it — and how you’ll market it online. It’s a low-cost, low-risk business opportunity that has a huge upside! Do You Know All of the Ways You Can Make Money Online?